Colors bright and cheery! 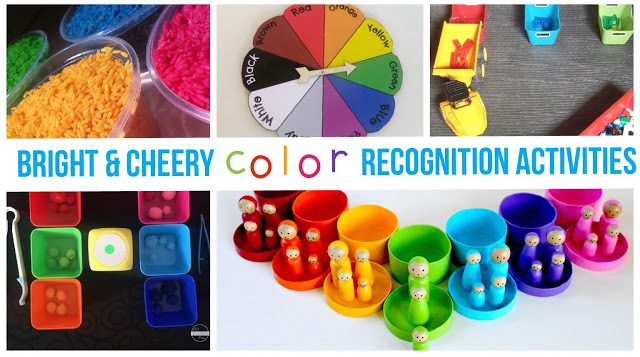 Perhaps you need to see these fabulous color recognition activities if your days have been dreary! Well, while I am in the rhyming mood, heck out this fun Color Chant to say/sing with the little ones to teach colors! Why don’t you use this Fruit Loop Maths Game during snack time, perfect way to practice color recognition AND have a snack afterwards! Or make your own rainbow abacus. Busy bags like this Color Sorting Busy Bag and this Felt color sorting Busy Bag is perfect for quiet time or let the kids play with a set of DIY rainbow peg dolls. Get out the Legos and use it for a fun Lego dumping and color sorting activity. Or, make your own Color Block Puzzles! Print out these Crayon Color Match cards, perfect for a child who loves “schoolwork” or use this Color Hunt Spinner to go on a color hunt. Or make your own Color Book with this free printable. Items like egg cartons and pompoms or pool noddles and pompoms are great to use AND it works on developing fine motor skills too! We love this color sorting pom pom activity. 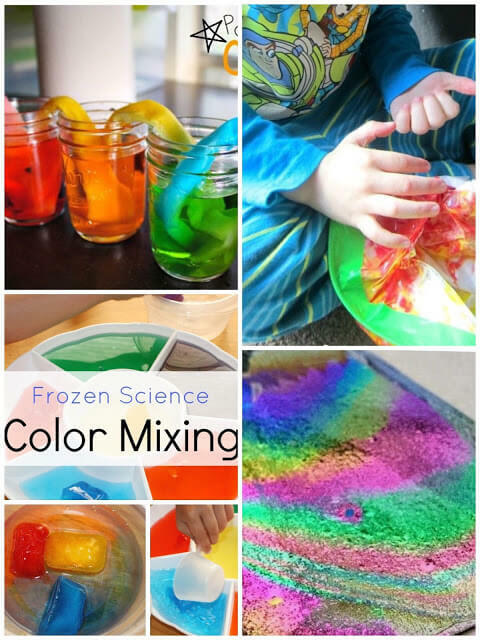 Use colors to teach science or STEM concepts like color mixing with ice or color mixing with shaving cream , color changing milk, walking colors, frozen rainbow eruptions, and even make your own rainbow paper! Work on those fine motor skills by Feeding the monster or pushing colored popsicle sticks through slits in a can. Play a game of sorting rainbow pompoms or Stack-a-Rainbow with colored stones, clever! Incorporate the sensory aspect so that your child can have multi-sensory experiences in terms of learning about colors and remember better too. 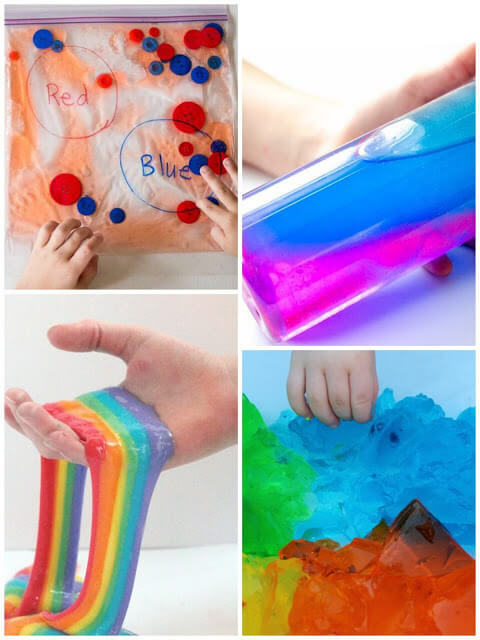 Try to make this pretty awesome rainbow slime, rainbow painting with cards, color sorting sensory bag with buttons, color sensory bottle or rainbow jello or make colorful, edible sand! You can even color rice and sand too! Let the children experience colors by using a whole body approach, that is gross motor activities. Make your own DIY Ring Toss or Color Toss or Color Skee Ball. Frugal fun! 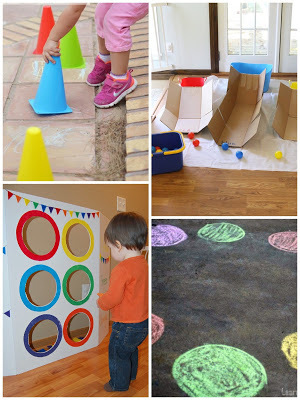 Play this gross motor color game, Color Hop and preschool color game the kids will love! And if you want to have a colorful snack, try these easy to make rainbow toast. 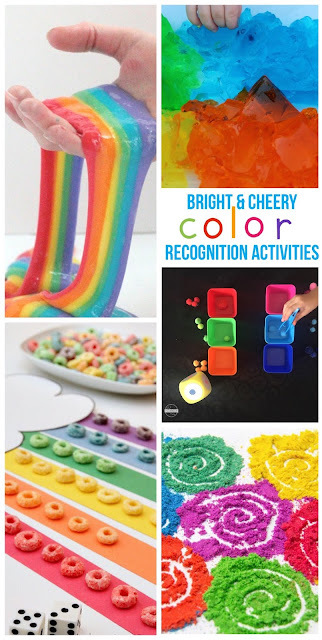 So many bright and cheery ideas to develop your children’s color recognition skills and all look like such fun! Which one will you try first?